The 4th of July often sneaks up on me. I think because I’m not anticipating the holiday until July finally arrives, and then I only have four days before it’s come and gone. 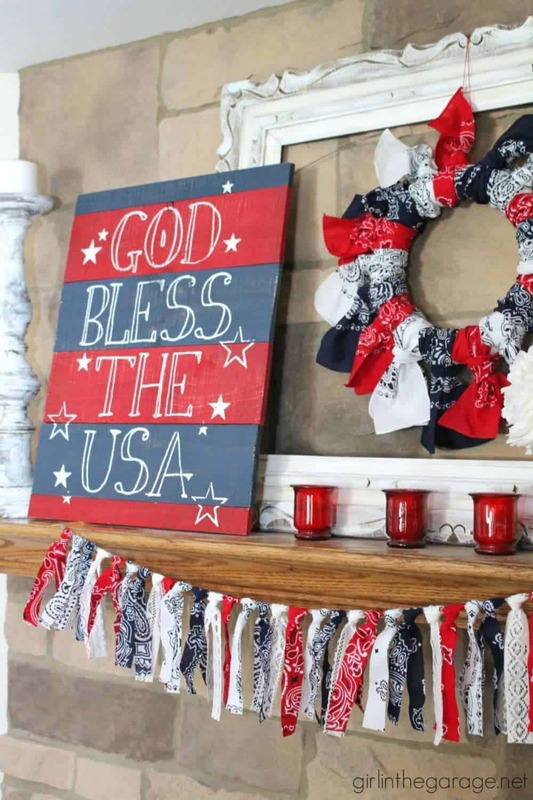 But this year, I am working on preparing my home for the holiday with patriotic colors of red, white, and blue! We wanted to give you some inspiration and decided to start with the first place you see — the front porch! Since I just moved into a farmhouse, the above picture caught my eye immediately! It has a welcoming, rustic vibe! The wicker furniture makes a great backdrop for the patriotic-themed pillows, and I love the look of the flag hung up on the wall! They incorporated the greenery with the red, white, and blue theme! I honestly wasn’t confident my house plants would fit on my porch next to these colors, but this picture proved me wrong. 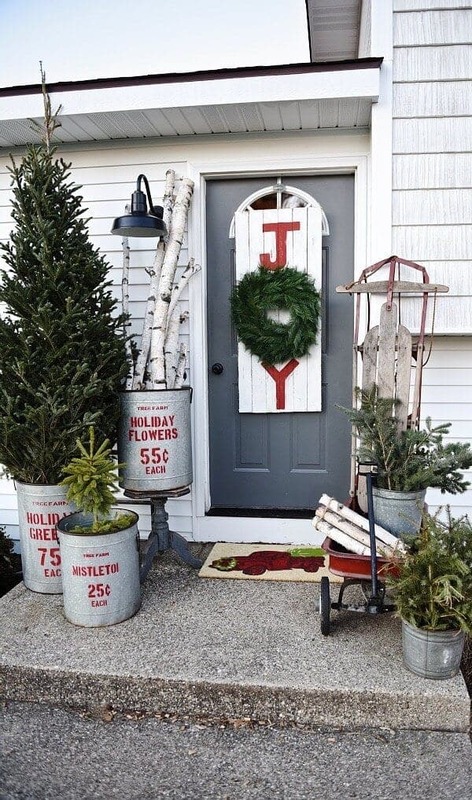 Check out Liz Marie Blog for more tips on farmhouse living and home decor inspiration! I love the simple look of this wreath. My home has an awkward front porch entryway. We have two doors side by side, and, no, it’s not a double door. It’s literally one door on one side of the porch and another door next to it. 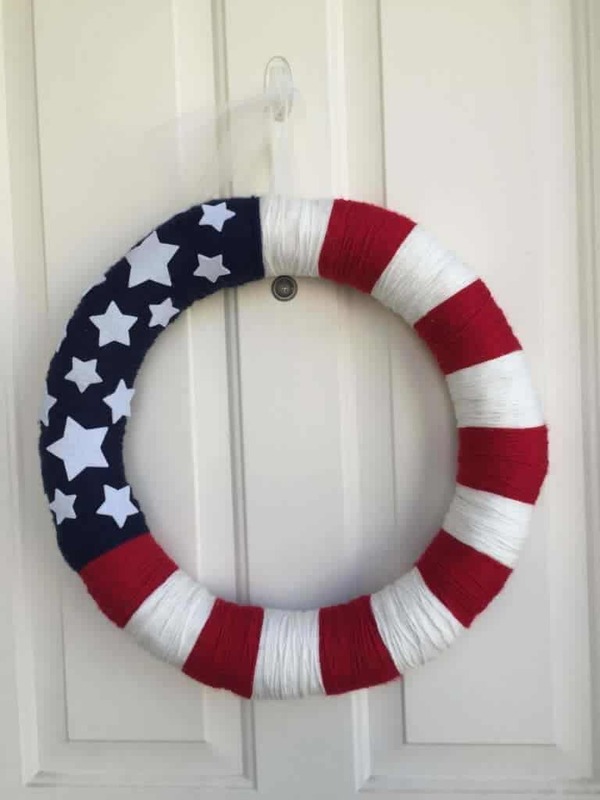 No one ever knows which door to come into, so this wreath looks like a great way for me to “mark” our entrance while showing pride this holiday. I am obsessed with rocking chairs! 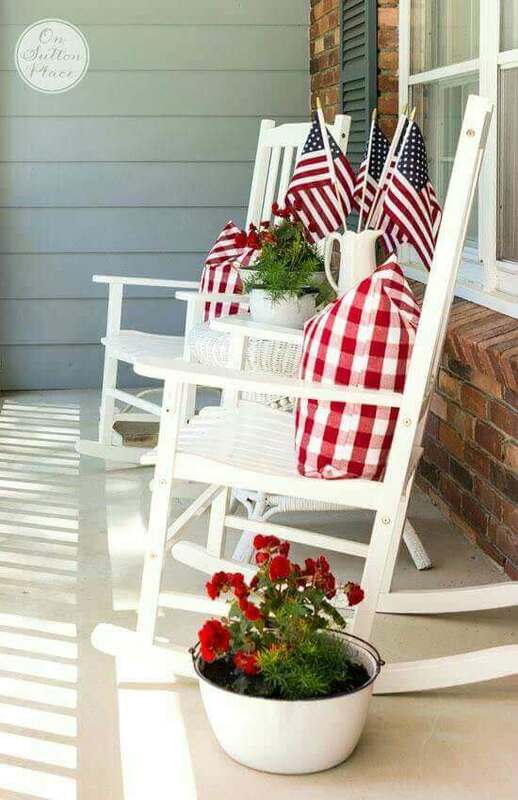 If I didn’t have a pretty awesome porch swing, I would have these white rocking chairs in a heartbeat! They look great with the bright, red checkered throw pillows! The white pitcher also makes a great vase for the arrangement of miniature American flags sitting on the table. Check out Princess Pinky Girl for tips on DIY, Home, and all things Pinterest! 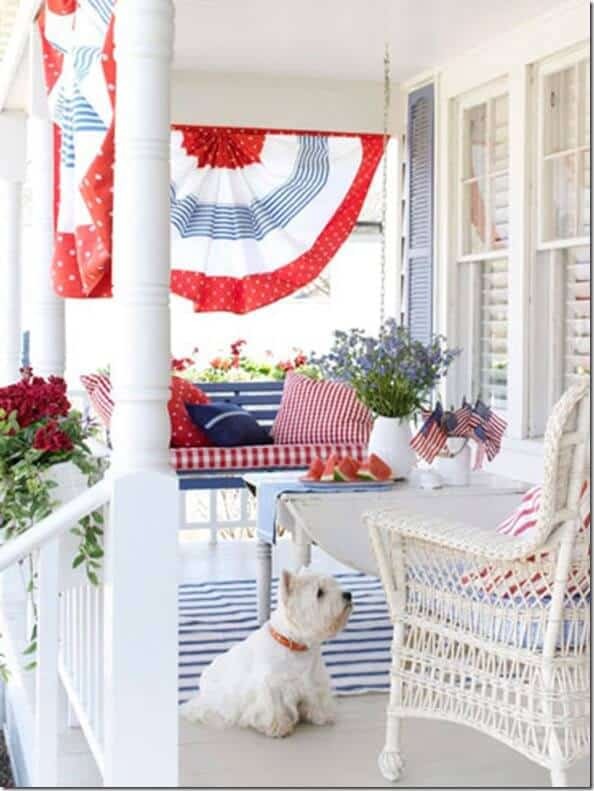 Blue stripes and red checkers pop on this white front porch! Even the dog is in the spirit while sporting a red collar! 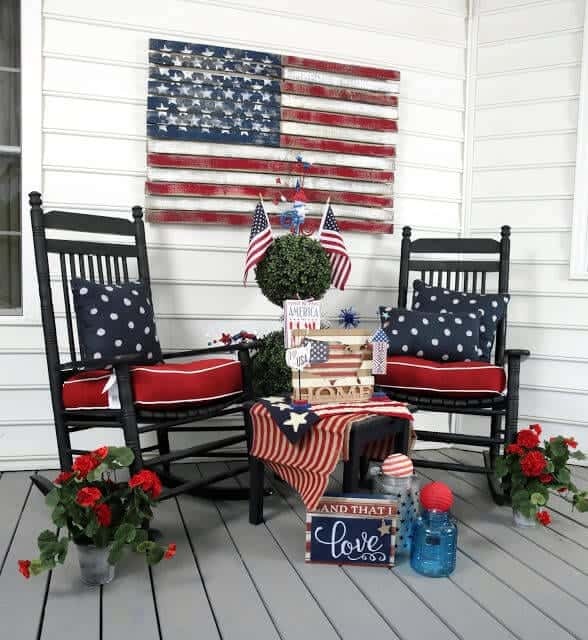 This porch definitely reflects an all-American love for this country! 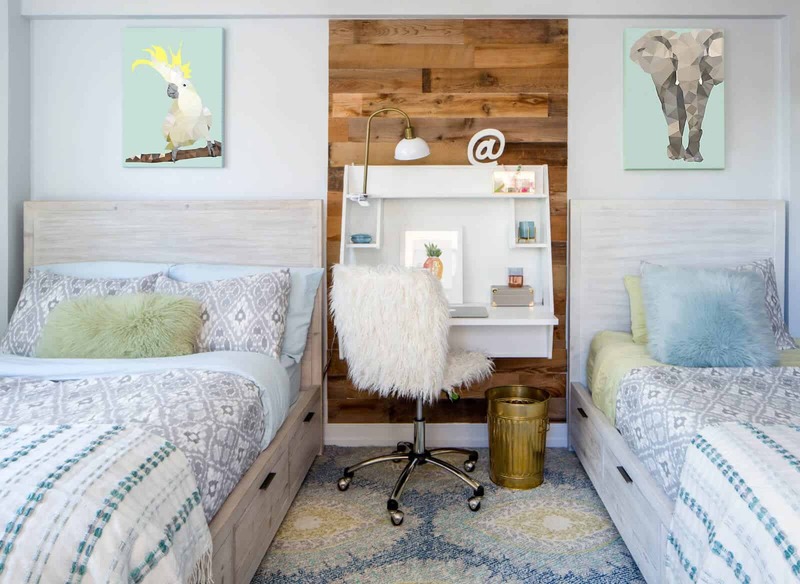 Check out Design Addict Mom that shares interior design news and trends, interior design projects, and all the beauty that goes along with being addicted to design! Pallets are an inexpensive way to decorate. 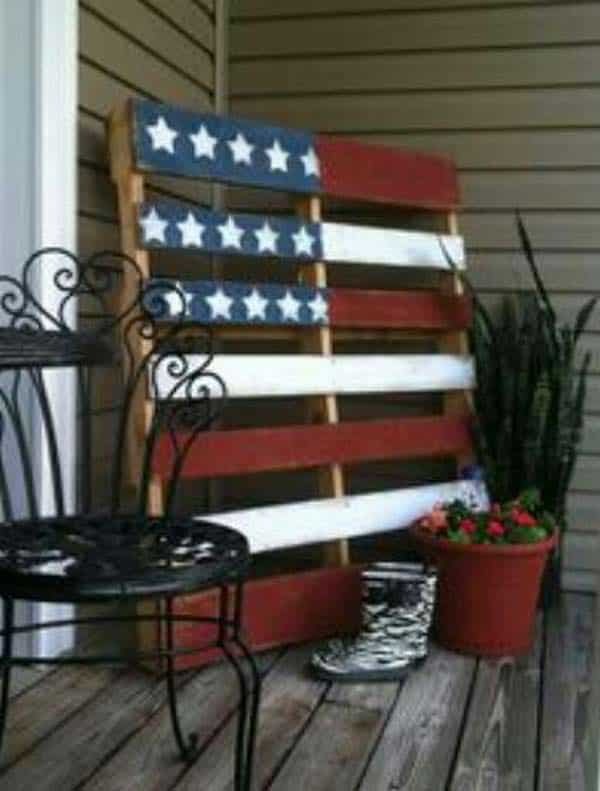 This flag pallet could be a project for the whole family! It’s imperfections give it a weathered look and makes it a great fit for an older porch! Check out Woo Home for DIY, home decor, and interior tips. 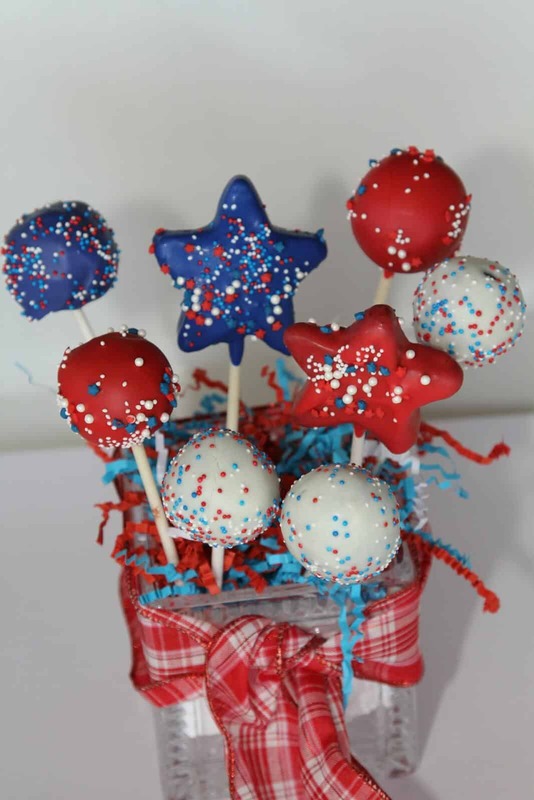 Polka dots are a fun alternative to the patriotic stars and stripes. Set the pillows next to a poppy red to make a patriotic statement. Decorate the topiary with a Fourth of July theme to use as the table’s centerpiece. 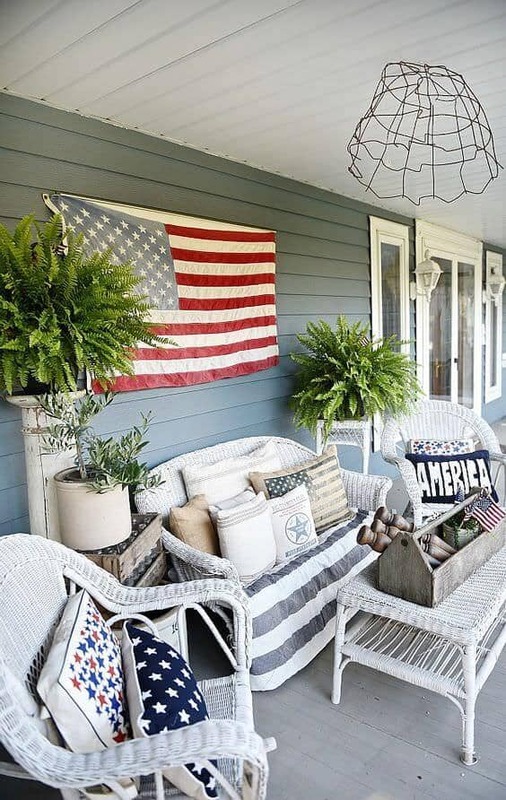 The wide variety of patriotic decor in this front porch layout can also be reused for any weekend holiday celebrations! Check out Trees ‘n Trends for home, fashion and decor, and more! 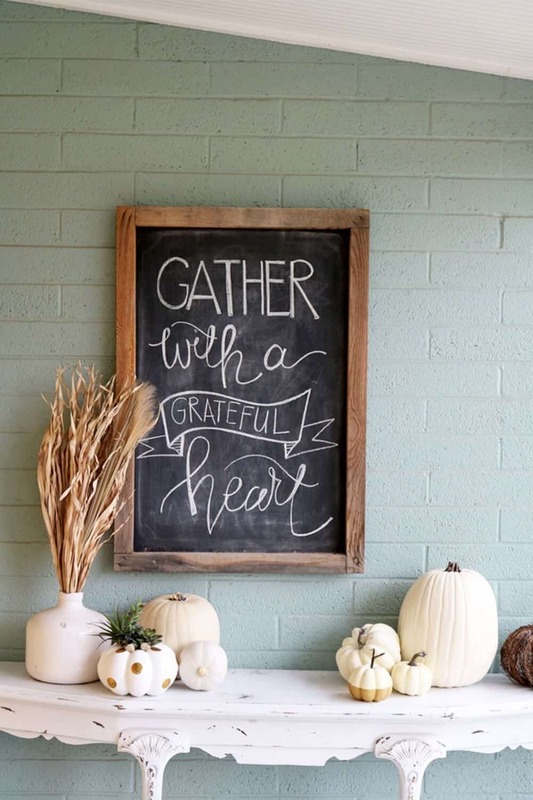 Chalkboards are popular, so most of us already have one hanging up somewhere in our home. 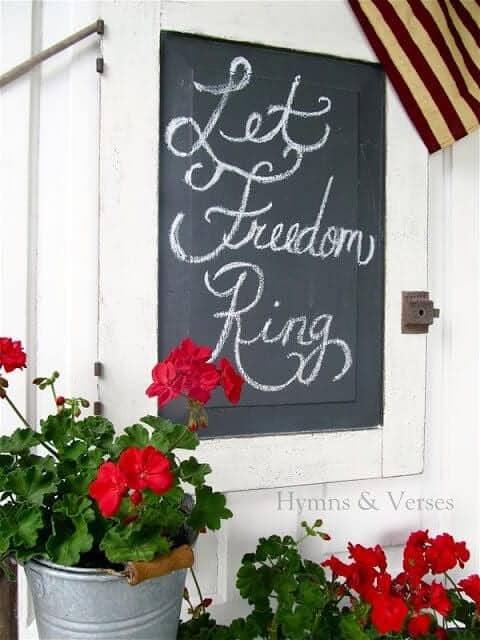 Instead of buying brand new decor for the Fourth of July holiday, reuse what you already have and add a red, white, and blue accessory or patriotic saying such as “Let Freedom Ring” written on a chalkboard. Check out Hymns and Verses and find inspiration for your home and life! 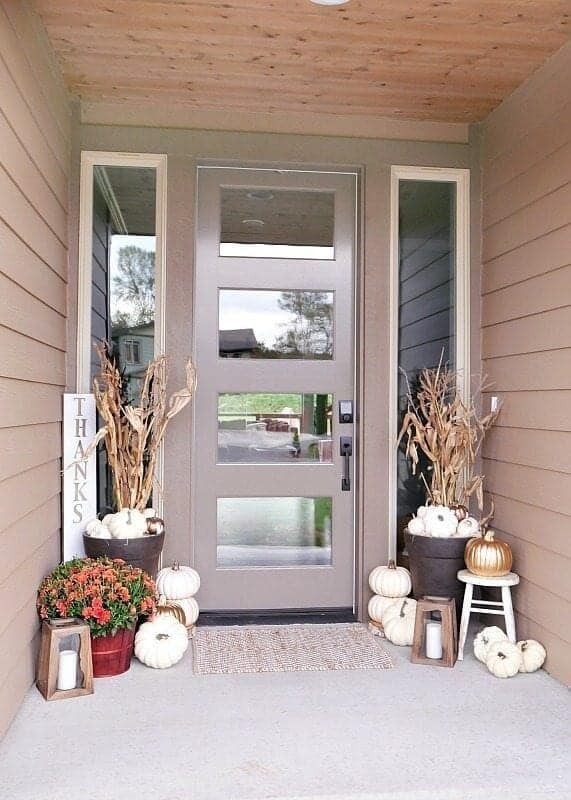 Tell us in the comments which front porch “look” is your favorite! 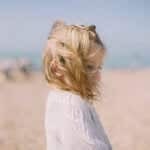 Previous article Why Is My Toddler So Moody? Why Is My Toddler So Moody?